New Providence Chiropractic is a comprehensive health facility ready to service the health care needs of you and your family. We specialize in chronic pain management, sports injuries and soft tissue rehabilitation. 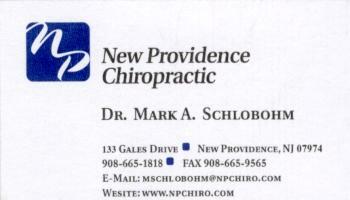 Dr. Schlobohm graduated from Chatham H.S., Bachelor of Science in biology at Villanova University, Pennsylvania, Doctor of Chiropractic from the Los Angeles College of Chiropractic. He is a treating physician for the US Decathlon Team, and a member of the American Chiropractic Association and the New Jersey Chiropractic Society. Dr. Schlobohm specializes in Applied Kinesiology, Gonstead, Sacro-occipital technique, diversified, the evaluation/ treatment of sports related injuries and spinal rehabilitation. He has been an attending physician at two Olympics, 1996 Atlanta and 2004 Athens, Greece. Also check out our "Secrets of the Pros" lunch lecture with Free Golf. Attend our free program, and play a free round of golf at Fairmont County Club in Chatham NJ.